The Junior League of Topeka has an active group of more than 250 sustaining members who continue to support the organization and our community. Sustainers continue JLT friendships through groups such as book clubs, an investment club, a wine club and others. Interested in joining our sustainers? We would love to have you! If you were a previous sustaining member of JLT or have moved to our area and would like to transfer your membership, please contact the JLT office at office@jltopeka.org or 785-273-0830. 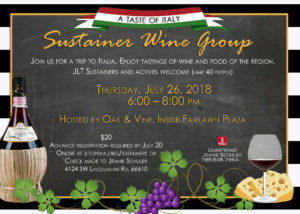 JOIN THE JLT SUSTAINER WINE GROUP FOR A TASTE OF ITALIA!!! Thursday, July 26, 2018 – 6:00 p.m.
$20 per-person. Please register by July 20. Please sign-in to the member portal on www.jltopeka.org to purchase your tickets, click HERE or pay Jeanie Schuler directly.